Husky Haven of LA, Inc. is a non-profit (501)c3 organization. Way back when.......in 1982, we lost our 2nd husky. As many have experienced, she had a history of conniving her way out of containment, and in a flash, she was down the street lickity split. I was in hot pursuit, chasing right behind her (which is actually the wrong thing to do) and proved no match for the speed of a Siberian desiring to follow the "call of the wild". I scanned the shelters, placed ads, and as time began to pass the possibility of finding her seemed to become less likely. Then, months later, the shelter (which is now Seeaca) called. They had found a very thin, young red & white Siberian with blue eyes who had been trapped in a storm drain. When I met her, she was not responsive to her name. She looked almost identical to my lost husky but just a little bit different in the face-in fact, she had a more beautiful face. She was extremely thin and withdrawn. It was decided she was not my missing dog. She was placed in a pen and after visiting with her I left. Thoughts about her haunted me day and night for the next week. I called to check on her and she was still unclaimed. Exactly 7 days later, I was compelled to return to the shelter. I was informed she had not eaten at all the entire week and she had only 30 minutes until her time was up! I didn't have my spouse's permission and I didn't plan on adopting her! And I hadn't given up on finding my lost husky. And she was so thin she looked like she was ill. And would my 1st husky at home get along with her? And, and, and---------I couldn't leave her there!!! And so------she couldn't jump into my car fast enough! She was thrilled to be sprung. She turned back and took one last look at the shelter and licked me in the face. She never had to worry about winding up there again. Liberty lived to 20 and 1/2 years! She almost doubled the normal lifespan of 12 years. She was our first rescue and I firmly believe I didn't chose to rescue but I was lucky to be chosen when Liberty summoned me to the shelter that fateful day. Before adopting Liberty, I was naive and unaware of the terrible situation of huge amounts of dogs and cats winding up in shelters either by being impounded off the streets by animal control or the astonishing amount of people giving up their animals. I had purchased my first 2 huskies at pet stores where they were flown in from mid-western puppy mills at a very young, inappropriate age. I had no idea this beautiful, intelligent breed that I adored could end up unwanted at animal shelters often living their last days there. I was under the misconception that only "bad" dogs were at pounds. The truth is the great majority of dogs at pounds have ended up there at no fault of their own at all--in fact, its their owners who are "bad". The 3 main reasons so many dogs/cats are unwanted is because of overpopulation, the owner's failure to research the breed they are interested in, and the owner's failure to seek guidance/training to resolve problems they are experiencing. These 3 main reasons can be rectified! Please spay/neuter your pets and encourage everyone you meet to do the same! Please do research on the breed you are interested in and really ask yourself if your family setting is the proper environment and you are willing to put forth the effort that this breed requires in order to be happy. Thirdly, be willing to seek advice and attend training classes with your dog in order to rectify problems you are experiencing. If these goals could be attained, we could all make a huge difference in the amount of unwanted pets. PLEASE HELP!!! You never know: There could be a "Liberty" waiting for you right NOW! 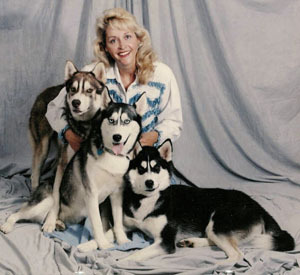 Copyright © 2011-2012 Husky Haven of LA, Inc. All rights reserved.